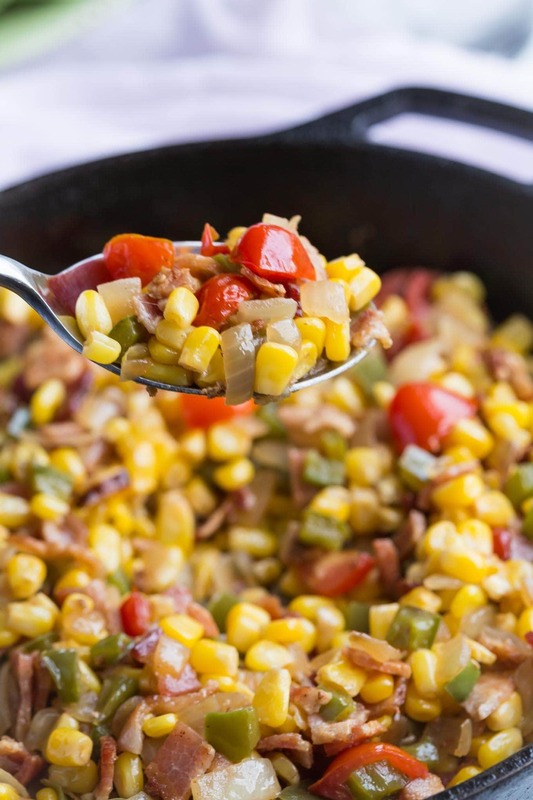 Corn Maque Choux is a classic Cajun and southern side dish that’s simple to make and packed with flavor, my version is gluten free. I first tasted Corn Maque Choux when I went out to eat and knew right away that I wanted to recreate it at home! 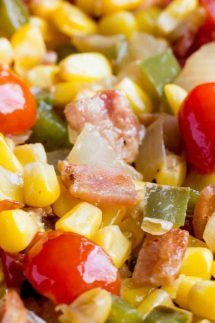 It’s an easy side dish to make and is packed with wonderful flavors including, corn, bacon, bell peppers, cherry tomatoes and green onions. 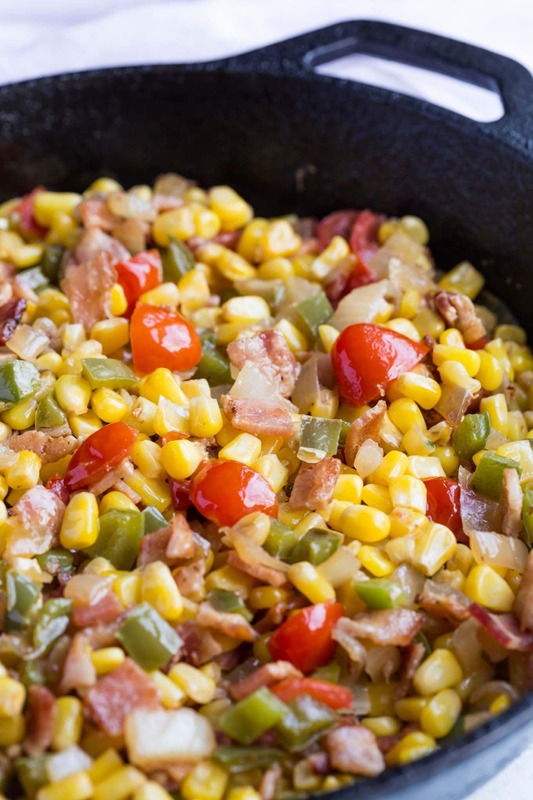 Corn Maque choux is a dish native to Southern Louisiana and is thought to have a Creole influence . The classic version of this recipe contains corn, bell peppers, onion, and sometimes garlic, celery, and tomato. The dish is then traditionally braised with a little bacon grease, and sometimes hot sauce is added to heat it up a little. For my version of Corn Maque Choux I decided to leave out the celery and added bacon instead, because bacon makes everything better! The salty bacon flavor really enhances the flavors of the vegetables and transforms this into a side dish that really packs a flavor punch. This is an outstanding recipe if you can use grilled fresh corn, it’s really worth it! Prep all your vegetables before you start cooking, that way you can throw them all in together. If you have time you could cook the bacon separately and get it super crispy, then stir in at the end. Serve this with some Memphis Style Ribs for a hearty Southern meal! 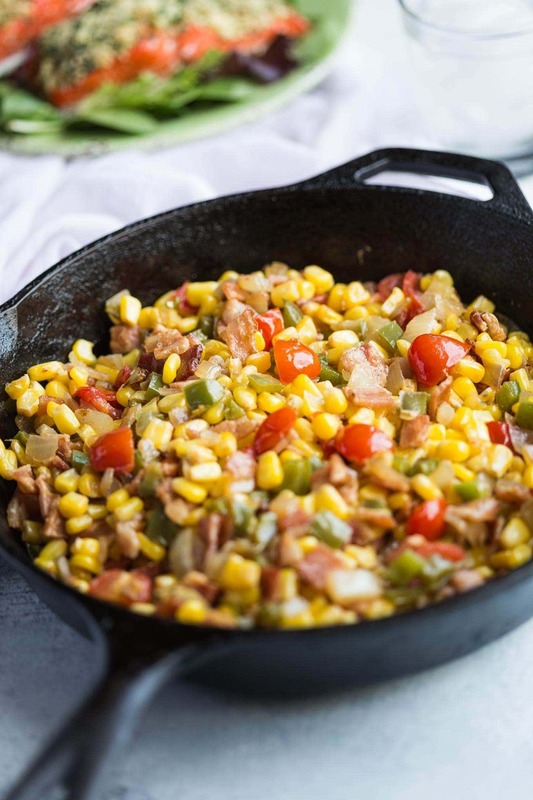 A quality non stick skillet is a must to cook your corn maque choux in. I used my well seasoned cast iron skillet for this recipe. You should be able to find all the ingredients for this recipe at any grocery store. I used frozen corn because it’s January and there’s no fresh corn to be had in Mississippi at this time of year, but if it’s in season I would choose fresh corn over frozen. 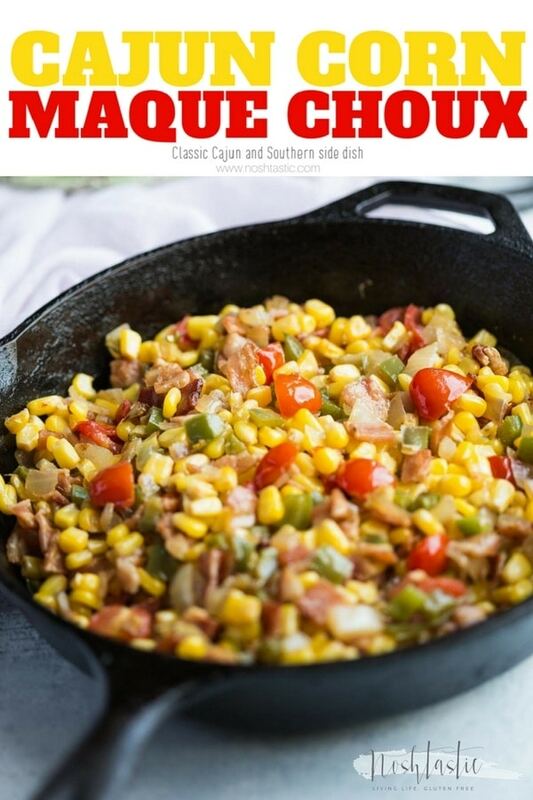 recreate this classic Southern recipe for Corn Maque Choux at home! Watch my short recipe video first! you'll find it after the recipe directions. Sauté onions and bell pepper in hot oil in a large skillet over medium heat until soft. Add corn, tomatoes, and bacon; cook for 10- 15 minutes. Stir in chopped green onions, salt, and pepper; cook 5 more minutes. I added heavy cream and chicken broth to make a sauce with it to have over rice. It was delicious . I also add cayenne pepper to add a kick to it. Making this for a church function(doubling) the effort. Made this dish with my Cajun-style turkey last Thanksgiving. Unbelievably delicious! It was a big hit!